The Community of Itumbauzo have raised their voices against the lies and immature politicking of Benjamin Kalu, the APC candidate running for the Bende Federal constituency. It was with Joy that the community celebrated days back over the intervention of the popular choice, Dr Chimaobi Desmond Anyaso in fixing the black out of electricity in the community by reconstituting their faulty transformer which has since been fixed. Indigenes of the community as well as the traditional rulers were however perturbed by the ridiculous actions of Benjamin Kalu who instructed his few supporters to make a video denying the obvious fact that the said transformer was truly reconstituted by the benevolent act of kindness of Dr Chimaobi Desmond Anyaso who hails from Igbere but came to their aid when they called on him, something Benjamin Kalu failed miserably at. The community elders of Itumbauzo admitted that they have heard of how Benjamin Kalu has been brewing lies, bad blood and pressuring the youths to start vices in the community but his antics won’t solve anything because he (Benjamin Kalu) has been rejected at home, thus his efforts doesn’t stand and have their blessings. 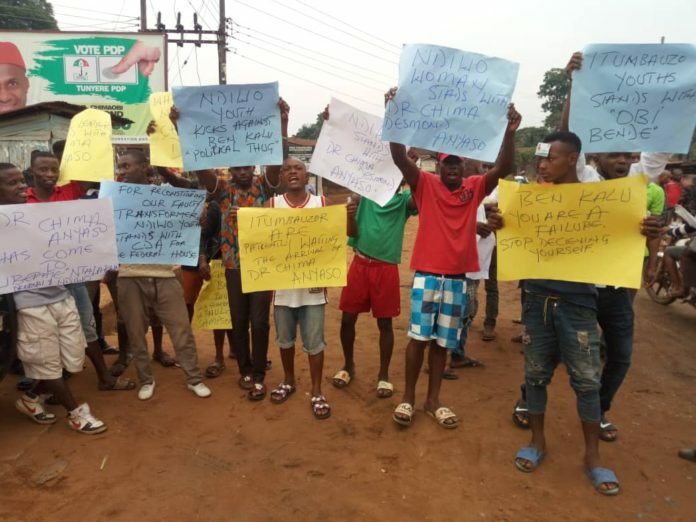 The Ndiwo youths of Itumbauzo community were evidently seen trouping out with placards praising and pledging their undying support for Dr Chimaobi Desmond Anyaso “Obi Bende”, a man who they acknowledge is a grass root developer and A First Class Leader. The youths keyed into the philosophy of the Ndi Ezeogo by maintaining that Benjamin Kalu is without their support due to his cumulative failures and attempts to disgrace the Community. They decried his Fire brigade ambition which was never nurtured healthily but was birthed by desperate attempts of Deceit and manipulation. The youths also called bluff Benjamin’s propaganda on social media through his paid media propagandist Iheonu Chukwuemeka Astrus who has continued to write lies and have constantly made personal libelous posts about Chima Desmond Anyaso on various social media channels. The people of the community jointly praised Dr Chimaobi Desmond Anyaso for making it possible for electricity to be possible once again in their community and vowed to troupe out and vote him on election day and also make sure that their votes are counted and publicly announced by the various presiding officers.